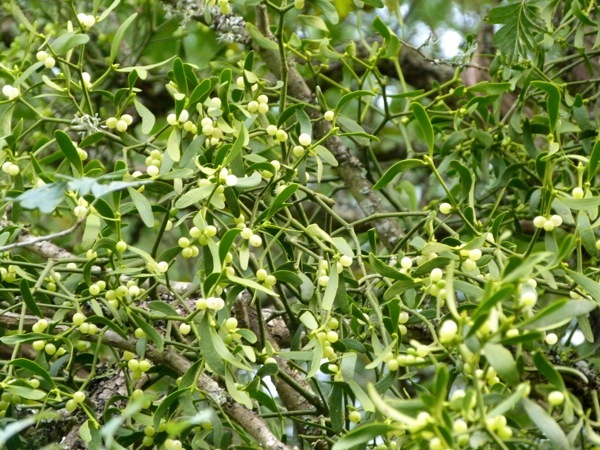 Mistletoe seems to be much more common in France than the UK. This is maybe because it needs clean air and established trees to thrive, and France is both more sparsely populated, and less intensively farmed. We often see the big, tangled balls of leaves and berries when the trees are bare in the winter. In fact, we have some in one of the trees that borders our garden, as you can see. It’s an interesting plant, partly because of the way it germinates and grows on a host tree, and partly because of the wealth of folklore associated with it. The best known of these is the tradition of kissing beneath it at Christmas, but it has a place in mythology going back to Ancient Greece. From my point of view, the leaves and berries lend themselves to beaded jewellery. I had a 1950s simulated pearl necklace that I’d been hanging on to until the right project came along. 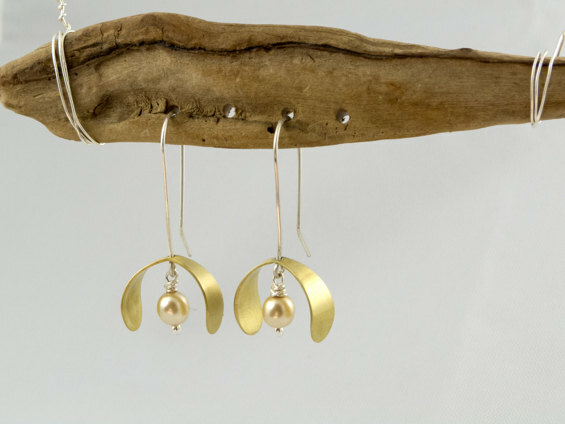 The small creamy pearls made perfect little mistletoe berries, and just needed to be suspended underneath brass leaves, with a matte brushed finish. The finished earrings are ideal for the party season, and would make a pretty Christmas gift. The leaves and berries hang from a silver earring wire, with an overall drop of just under 4cm. They come gift boxed, and they are available from my Etsy shop now. I love that your designs are so inspired by nature. Beautiful!